It took a while for Simon Rosenbach to find his second career. The veteran assistant Middlesex County prosecutor, due to retire at the end of the year, is studying to become a rabbi. And Rosenbach, 61, has landed in a place of distinction. 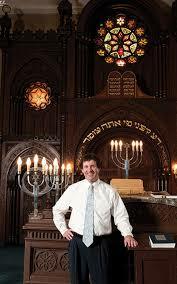 He has secured a post as the spiritual leader at Ahavas Sholom, known as the last synagogue in Newark. The weathered synagogue is a survivor in a city that once boasted a large Jewish population that has long since dispersed to the suburbs. His rabbinical studies will last another three years. Rosenbach, who has earned a reputation as a scholar among prosecutors, worries that he’s not smart enough for the role as he makes the transition from courtroom to pulpit. It is that down-to-earth approach that has served him at the synagogue. In the five years since Rosenbach has been at Ahavas Sholom, the synagogue has grown, Freedman said. Twenty additional congregants a year might not seem like much But the congregation is small. It is also especially diverse. Rosenbach has so far served as a volunteer. That changes to a paid position when he retires from the prosecutor’s office at the end of the year, Freedman said. Rosenbach has spent nearly all of his 37 years as an attorney working on appellate issues. While other prosecutors grapple with plea negotiations, trial preparation, jury selection and trials, Rosenbach wrestles with the intricacies of criminal law. Years of arduous work went by before his true personality surfaced. “The flippant quipster that everybody takes me for — that took a while to evolve,” he said. Colleagues readily praise his intelligence and legal acumen. His scholarly enthusiasm often prompts him to range far beyond the topic at hand. Go into speak to him about a search and seizure case, and you come out having learned about that as well as the Erie Canal. In a discussion in his office on his new role, it wasn’t the law or Judaism that Rosenbach first mentioned, but the biographies of Lyndon B. Johnson by Robert Caro. He brings that curiosity to his sermons. On a recent Saturday, he related a passage in the Old Testament to Philip Roth’s novel “Goodbye, Columbus.” Rosenbach was making a point about how people subconsciously confess to a misdeed through some revealing action because they need help in dealing with a personal flaw. Rosenbach, who has three grown children with his wife of 38 years, Gayle, considered rabbinical school when he graduated from Rutgers University in the early 1970s. “I didn’t think I was smart enough, didn’t think I was observant enough, didn’t think I was steeped enough in the tradition,” he said. So he turned to the law. It took another three decades for Rosenbach to reconsider his religious path. “When I turned 55, I said I don’t want to live to be 90 and say I wished I had done this,” he said. He began studying at the Academy for Jewish Religion in Riverdale, N.Y., headquartered, ironically, at the College of Mount Saint Vincent, a Catholic and ecumenical liberal arts college. For Rosenbach, the rigors of his studies after years of working with legal theory still leave him concerned, in awe maybe.